Stainless Steel Tie Bars with Real Stone. Each 3 piece set comes with. These tie bars are perfect for any occasional. 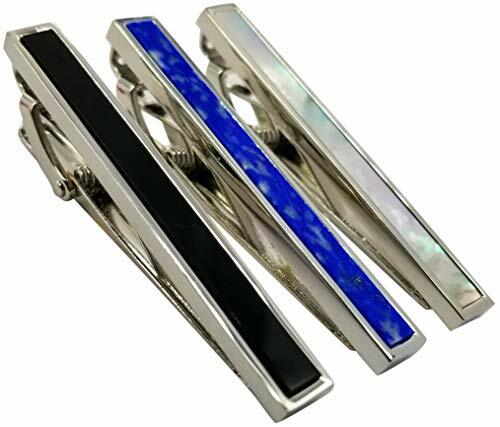 Make your style unique with these beautiful tie clips. REAL STONE - Each set comes with three different types of Stone - Onyx, Lapis, and Pearl. CASE - Comes with a box to store your Tie Bar Set when not in use. SIZE - 2 inches in length & 0.7 Inch in height. PERFECT FOR ANY OCCASION - Customize your style at any wedding, party, business meeting, or formal occasion. LOVE YOUR TIE BARS GUARANTEE! - We guarantee you will love tie bar set! If you have any questions about this product by Blue Aspen, contact us by completing and submitting the form below. If you are looking for a specif part number, please include it with your message.